I've never caught one, I know guys that do and they fish a tiny hook from a float about 12" or so from the surface. I go after fish with big teeth for the most part, smallies are great to catch and eat as well. Now, my fishing is limited to the Mississippi River in area between St. Paul and Minneapolis where the river cuts through the the limestone leaving an area with 50' sheer cliffs to climb up and down. - Fast water and lots of gravel bottoms or holes where the big walleyes are. there good fishing there? we have good friends who live on st. croix...that is such a zoo boat traffic wise, how would you ever fish? is the Mississippi better? was on the river quite a bit with them, whole river was a huge wake. The lower portion (below Stillwater) is over-run with cruisers (small and huge) and runabouts and jets. My daughter has a cruiser there and they use it like a lake cabin and occasionally take it out. They do have access to a jet ski. - For that stretch, it is definitely too busy on week-ends, but there still is some good fishing during the week IF you know the river. Above Stillwater it is very fishable and better suited to smaller boats or canoes. There is some fishing for sturgeon down from the in Taylors Falls/St. Croix dam. - Too bad the legal number limits are pretty restrictive. Shore access is a little tough and requires some walking. The Mississippi below the Ford dam and locks has light pleasure boat pressure because of the occasional barge. There are islands and back channels and fishing from shore. Above the Ford dam, the access is by climbing down either side or where the Minnehaha Creek Falls empties into the River. - I usually fished the St. Paul side because I lived a short block and 50' above the river. Definitely sounds different that the way I know. When compared to hooks used for pike I imagine the hooks do seem tiny. One of my younger brothers is obsessed with fishing for those big toothy critters. Goes up into your part of the world every summer to fish for them. 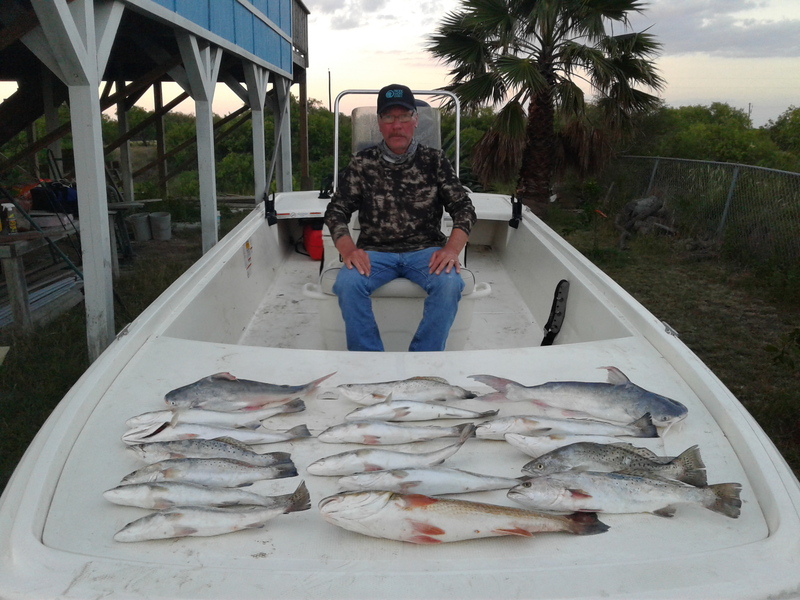 Trout bite was on at Matagorda bay this weekend. Nice catch Darren! Are they good to eat that size? What did it weigh? 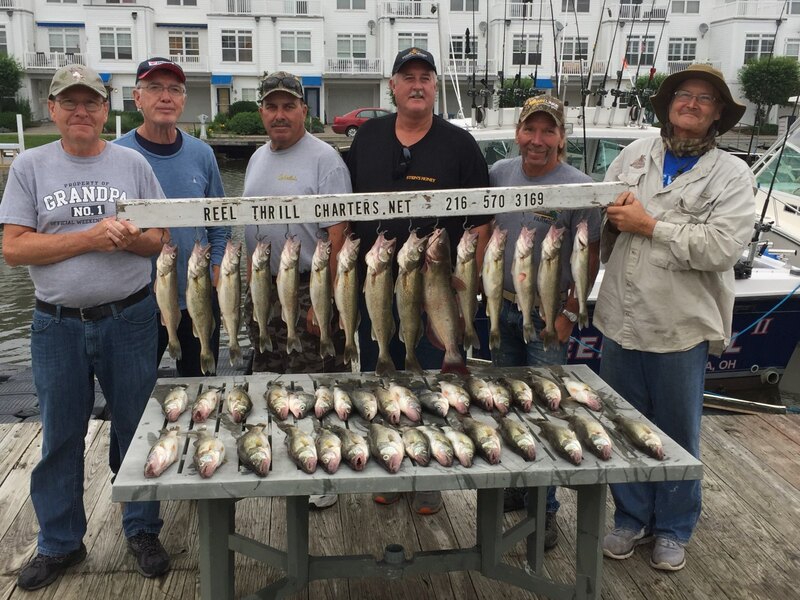 My bro back in Ohio says the walleye are biting on Lake Erie. He says they all were caught in 2 hours of fishing. I've eaten some, very good for sweet water fish, but have yet to catch any. On the bucket list tho. Walleye fishing is decent around here on the Ottawa river. Mild, flakey tender, white flesh fish with a subtle sweetness to it. Nice fish and a good meal for even a person who claims they don't like fish. I'd still take a nice tuna steak over it though. I've eaten some of that freshwater stuff. Some of them were really good. Lakers and walleye we're really tasty. Seems to hold up for a longer time in the fridge. Still a salt water guy though. Nothing better for all around type of cooking fish then fresh ARS or a big mangrove. Been too long, some friends went out recently and did really well on the rusty bellies and reds. I hear ya Rob. I'm due for a snapper trip, haven't been in awhile. We have a longer season this year plus we can do state water trips anytime and catch decent fish. I know a spot at Port A you can fill a cooler up with the mangroves too. When it comes to fishing tho, I'm not picky long as I have something tugging on my line. Those all look 2-3 pounders. Best eating size. They do look like good eaters. I was surprised when he told me the charter was out of Lorain. Back when I was a kid you could see turds floating in the water along the beach and there were warning signs about swimming. Also a lot of industrial pollution from all the plants that use to be there. Lake Erie has made a heck of a comeback from those days. Just got back from there today. Three days of fishing, all great. Friday took about four hours, but Thurs and Sat were 2 1/2 to 3 hours. Six people, six fish each. Sorry no pics, go there every year so don't think about taking any. 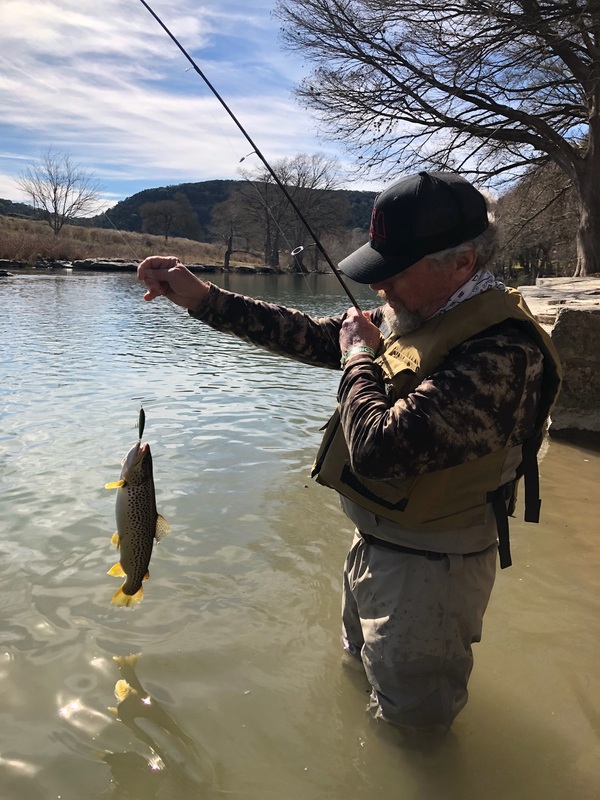 Finally got over to the Guadalupe for some trout fishing. Had to show SNL the ropes on catching the bigger trout not the stockers the state puts in. My go to lure was hot again today as usual, we both caught some nice rainbows and brown. He was striking out and I had already strung a keeper rainbow so we changed rods. After that he did well and I barely caught any. I had no idea we had trout that size in the river. Only in a small section under the canyon lake dam. TU puts those big fish in there every year, hats off to them for that. They try to be somewhat secretive about where they put them in tho, can't say I blame them for that either. My issue with them is how they have managed to influence state fishing regs in a public waterway, all for the benefit of a select few stocking a non native fish. I use to live there and learned their stocking spots so I take full advantage of it, it's my river too, ha. That big rainbow was the best fighting fish I've caught out of there and I have caught bigger. He fought like a redfish taking drag over and over again not wanting to come to hand. Leaped out of the water right as a raft of TU boys were floating by which made it all the sweeter for me. The place was ate up with TU folks doing a kid fish, which I commend them for. However I did not see a single fish caught by any of them. They particularly don't like folks like me who come catch "their fish" on their turf using those dreaded bass plugs with treble hooks and to their utter dismay I eat them too, ha. SNL heard the guide floating by comment that " oh yeah we just put a bunch in here". That comment showed his ignorance as that fish was a holdover trout, meaning it came from last years stocking living til yesterday. I could tell by the fight and the red color he was no freshly stocked fish. The browns we caught we no doubt just stocked, not as big and not much fight in them. Here's one just under legal size. Stupid site won't let me show the other pic of that rainbow showing a truer sense of his size. Last edited by deckman22; 01-21-2019 at 10:33 AM. Last edited by deckman22; 01-21-2019 at 10:32 AM. Damn nice looking feesh there Al. 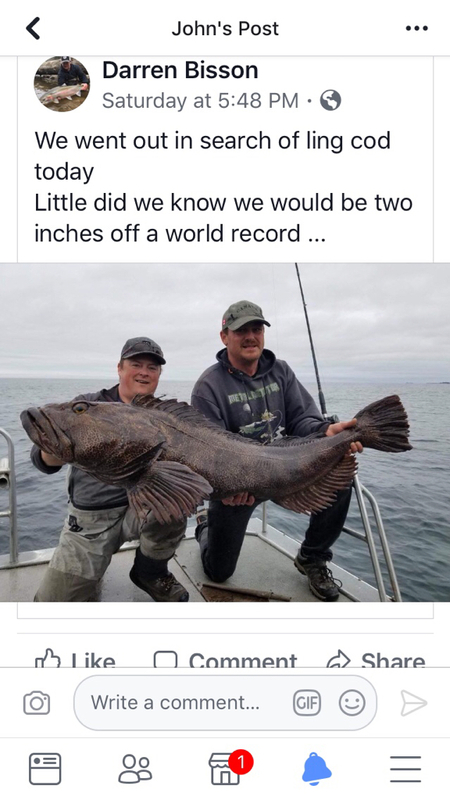 You do know just because you post it twice doesn't mean the fish doubled in size right? Yeah, I didn't mean to post that one. 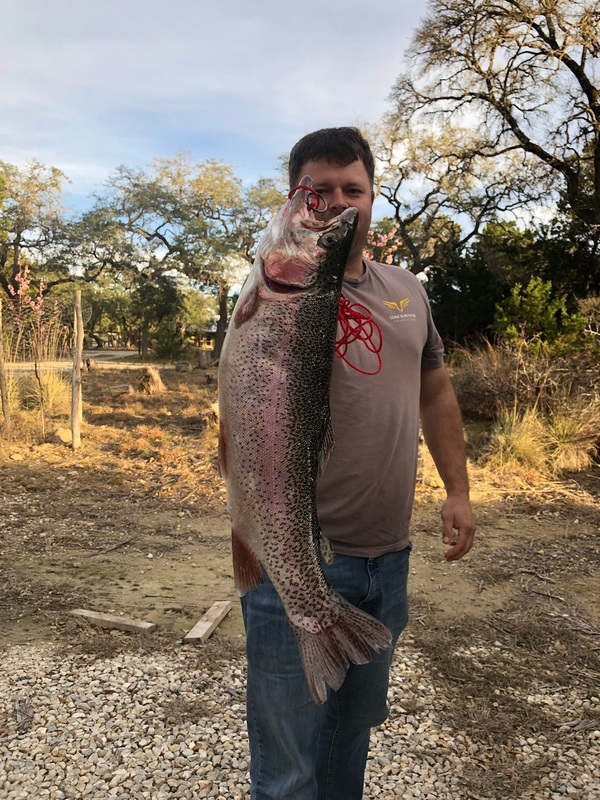 I had another pic of that rainbow that showed his true size. SNL was showing me how to "cheat" when we got home to make him look bigger. Not that I would ever want to do that, ha.